Why Training Your Dog is Important For a Healthy, Well Balanced Life! 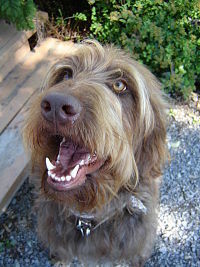 What does training your dog have to do with a website about dog nutrition and dog health? In my opinion, a well trained dog is a balanced, happy, dog. It's like food for the dog soul. We are all looking for happiness and fulfilment of our life purpose, aren't we? I think dogs are like people. They are multi-faceted creatures that play an important role in the lives of the people they live with. In my opinion, dogs are not that different from humans. They are spiritual beings existing within a physical body. Dogs live with us, and so they must function within the social framework that we set for them. We all want our dogs to be well behaved. A well behaved, balanced dog can lead a happy, emotionally healthy, stress free life. This will go along way toward reducing dog health problems too. Training your dog will help to make this possible! Believe me, I am not a dog obedience trainer! 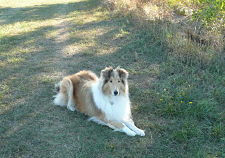 But as a Natural Health Coach for people and dogs, I understand the importance of training your dog. So often, I see dogs with health problems that are related to the human owners inability to get a grip on their own lives. Well that's another conversation! 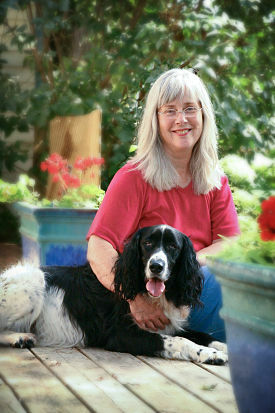 So, on this page you will find my favorite resources for training your dog and gaining insight into the canine psyche. All of these resources have helped me, in one way or another. As always, there is no one right way to do anything. We all have to find the way, that works for us. I love this photo of me and Pager. Take a close look at the expression on his face and in his eyes. Pager is a well behaved dog, but he has a mind of his own. Pager has a strong personality, but then, so do I.
English Springer Spaniels for example, have historically been bred as gun dogs, to work hunting birds. It is in their breeding to work hard. 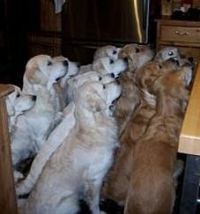 They are highly intelligent dogs. Since there will be no hunting of birds around here, working on dog obedience training gives Pager's brain a chance to think constructively. Dogs have evolved to work alongside humans. I have never known a dog that didn't like to work at something. Training your dog serves as the work that is missing from the lives of many pet dogs. Wild dogs work every day, just to find food. Farm dogs work to guard and protect livestock. All dogs need to work, and find reward in the work that they do. So I constantly work with Pager on training. He watches me, and waits to find out what's next. Here's a great picture of Jager the English Springer Spaniel, practising training, sitting in his ' duck blind ' in the back yard. Springers were bred to help hunt ducks, so Jager is right at home. Practice makes perfect. He must ' stay ' and be quiet, so he doesn't scare the ducks. I am quite sure my Pager would love to join Jager on the duck hunt, but that won't happen. Successful basic dog obedience training will create a bond between you and your dog. Dogs, like children, function better with boundaries, and kind, caring guidance. 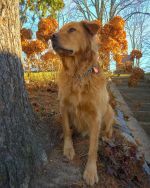 We want our dogs to have a well rounded, balanced life, that includes good healthy, natural dog food, meaningful work in the form of dog training, some fun and reduced stress. Training your dog, leaves your dog worry free. He can get on with having a happy, stress free life. Reduced stress is a good thing for both people and dogs. The last thing you need, is a dog that causes you stress. Living with a dog should be a pleasure, not a stressor. Many health problems are caused by, or made worse by high stress and anxiety levels. 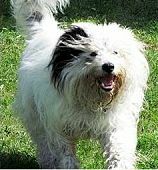 Many rescue dogs for example, have come from a background of emotional and physical stress. Pager is one of these dogs. The emotional life of dogs is a fascinating area of interest to me. After having lived with dogs my whole life long, I have come to know with all certainty that dogs have feelings too. 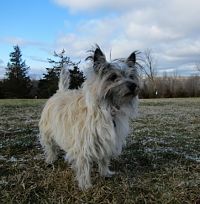 So, working on training your dog, as an on going event, will use up his energy both physically and mentally. I know that training your dog is not always easy, but I also know that you can learn how to train your dog. Just use some plain common sense, the patience that God gave you, and a few basic dog training tips. As a place to start, here's a great website that offers loads of free basic dog obedience training advice from a certified dog trainer. Darned if I know, But This is What I DO Know! The moment your dog came into your life you became a dog trainer. Did you know this? Dog training methods are not all the same. One size does not fit all. Dogs learn by making mistakes. The same as you or me. Training your dog is a lot like training your kids as they grow up. You help them learn what behaviors are acceptable, and what behaviors are not acceptable, so they can grow up to be productive, happy individuals who function well within the boundaries of our society. That goes for dogs too. In this way you help to prepare your dog for life in the real world. They will then be ready for anything, and you will be able to trust them to behave well in any situation that arises. You do this by building a trusting relationship with your dog, the same way you would do with your kids. ' Bad behavior ' is always an opportunity for learning. Mistakes can always be corrected and turned into something better. 10 Useful Dog Training Tips to Help You Train Your Dog at Home! Train your dog a little bit every day for short periods of time. Even well trained adult dogs always need some reinforcement training. If you don’t train your dog every day, both of you will forget the road you’ve already travelled. Besides, it's a good excuse to just ' be ' with your dog. How nice is that! Assemble your dog training tools. What do you need? A leash, an appropriate dog training collar, some healthy dog treats as reward, a clicker, a dog training whistle...get them ready beforehand. Always use the same voice commands and dog training hand signals, each and every time. How would you like it if someone changed the rules midstream? Always be consistent. You are training your dog to trust you. A strong and trusting bond is the ultimate reward in any relationship. Start training your dog indoors, so your dog can stay focused on learning where there is less distraction. Begin where you have your dog’s undivided attention, so he can learn where his focus should be...on you! Then practice outdoors, so he can learn to stay focused on you even with distractions around. Life is distracting whether indoors or out. It’s important to introduce distractions into your training so that your dog knows, despite that squirrel running by, that his attention should always be on you. Always follow training time with some play time. All work and no play makes Pager a dull dog. 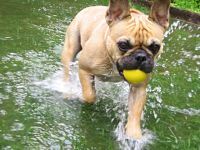 While training your dog is important for your dog’s mental and physical well-being, so is a little play time. The rule of life is work first, play later. Make sure to reward your dog for his hard work with some fun. Incorporate different commands into playtime. Sprinkling a few sit, stays, and lie down into play time, will keep him alert and on his toes! Training time can be any time! Socialization with other dogs and humans teaches your dog to behave in public settings. A trip to an off leash dog park, walks along city side walks, play dates with other dogs and doggy day care, are all important for socializing. Your body language is important. Stand straight and tall, arms at your sides, in a relaxed yet confident way. Be patient, mentally and emotionally strong. Relax. Take a deep breath. Take your time. Be clear and calm about what you want your dog to do. Learn to read your dog's body language. He will be reading yours. Dogs are experts at reading us.This is where ' think like a dog ' becomes important. Since your dog can’t speak, it’s important to read his body language to get clues about what he's feeling. Is he frightened, excited, bored, or confused by a command. 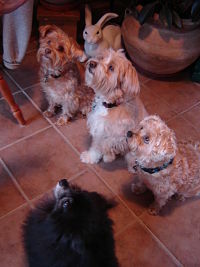 A great way to learn about a dog's body language is to watch your dog interact with other dogs. Pay attention to body posture. You can learn a lot from watching dogs socialize together. 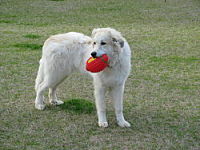 There are many good dog training books, educational materials and dog training videos. One size does not fit all. 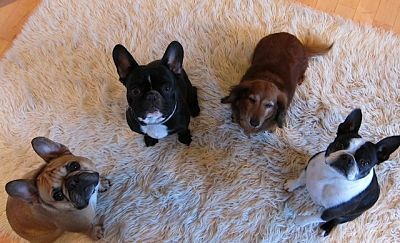 The best thing to do is get a professional certified dog trainer to help you. Don't be afraid to get help if you need it. I did. It was one of the best decisions I ever made. Like everything else in life that's worth having, there will be some work involved on your part. Dog training is not just for dogs. You will learn much about yourself. But You Always Get the Dog You Need! Meaningful work is food for the soul. Here's to your happy, healthy, well behaved dog! I wish you success. Enjoy your dog! Maybe I will, maybe I won't! I'm a very good dog. I always come when called! Just ask my Mom!